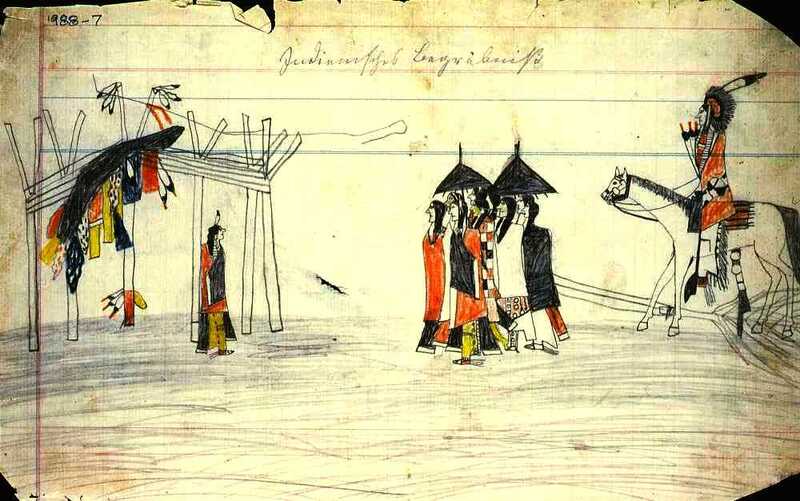 This detailed drawing, interpreted as “bringing boughs to the Sun Dance Lodge,” holds promise as identifying a specific tribe or culture. A mounted Indian man rides behind a group of people under umbrellas who appear to be pulling felled trees. The lodge is framed by upright poles or forked tree trunks and is adorned with feathers and bundles of goods (possible offerings). The long black object atop the lodge is thought to represent a stuffed buffalo skin which many tribes placed above the center pole. Although identified in the German label as “Indian burial”, the structure and boughs are thought to identify it as a Sun Dance Lodge. Father Peter Powell identified the scene as Kiowa because women of that tribe, unlike Cheyenne, assisted in bringing boughs to the lodge. However, the center pole appears to have a red stripe of paint, which some scholars believe was not a Kiowa tradition; most Kiowa lodge center poles were not painted. TARL Archives.